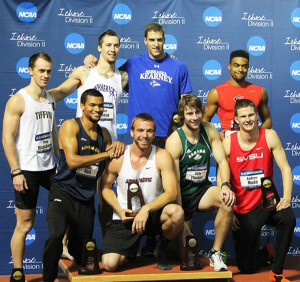 Justin Balczak, a 2011 Cedar Springs High School graduate, is now a national champion in the heptathlon. He competed for Asuza Pacific University, located in southern California, in the two-day NCAA Division II Indoor Championships in Birmingham, Alabama during the weekend of March 13. The heptathlon is a seven-event meet that measures speed, endurance, strength and agility. Balczak entered the meet seeded fourth in the nation and competed against 13 other athletes at the national championships. On day one, Balczak competed in the 60m dash (7.33 sec. ), long jump (22’ 3.5”), shot put (43’ 8.75” with a 16 lb. shot), and the high jump (personal best of 6’ 10.5”). Balczak’s marks put him in third place after the first day of competition. Day two brought on three different events—the 60m hurdles (8.24 sec), pole vault (14’ 9”) and concluded with the 1000m run (2:45 for another personal best). Balczak needed his personal best in the 1000 because he learned before the race that he was in second place and he needed to beat the first place competitor by 8 seconds. 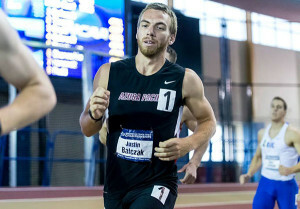 Balczak began his collegiate career at Lake Superior State University and was Division II All-American while attending. He sat out his junior season to prepare to transfer and face a new challenge. As a four-year member of the boys high school track and field team, Justin competed in the 110m high hurdles (2011 state champion), 300m intermediate hurdles (2011 state runner-up), 4x400m relay, 4x200m relay (member of the 2011 school record team), 4x100m relay and shot put (2011 conference champion). Even though he now high jumps 6’ 10”, and pole vaults 14’ 9”, he never tried those events while in high school. His next challenge is to prepare for the decathlon this spring. Added events include the discus, javelin and 400m dash.